I’m not really r﻿eporting, but I’m actually blogging. Fortunately for me, the line between reporting and blogging is seriously blurred, all in the sacrifice of journalism. But back to my point. 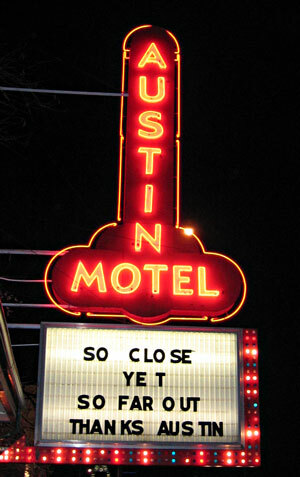 I’m here in the glorious Austin Motel, gently tapping away and reflecting on a big blur day of travelling. From some morning claws to feeling Mediterranean, it was both fast and eventful. In case you were wondering, I won last night at Settlers of Catan. I also lost after that. Catan is too much fun. The game combines the best parts of Monopoly, Jenga, and I think I tasted egg and cinnamon. If you have 3-4 people and about an hour to kill, take the time to play this ditty because it is totally worth it. After some tasty local donutry, my beautiful girlfriend and I hit the road to Austin. This year was a little different as we took 3 hours yesterday to make today much easier. And much easier it was. We blew through Oklahoma in the morning and then enjoyed some tasty fare in Texas before hitting Austin. Miguelito’s has the tastiest Mexican beef stew that I’ve ever had. Make a point to drop by there if you are around the area. Compared to last year, our drive was much easier. It paid off in dividends as we now have some time to take for tomorrow’s SXSW kick off. Today we picked up our badges and suspiciously light schwag bags. We lapped the convention center and pinpointed our favorite places before returning back to our hotel. And what a great hotel it is. Last year, we stopped by Joe’s Hot Coffee everyday and noticed that the Austin Motel was way close and more scenic than the place we stayed at last year. Fast forward to December last year and about a 100 tries where you have yours truly landing an exclusive spot in the scenic Austin Motel. We have the Mediterranean room and enjoying every second of it. Tomorrow has plenty of activity for us and I’m glad our home for the next week and half has a landscape painting of Red Sea on a wall.